Please respect ownership of the text and images on this blog by not reproducing them without permission. If you have been so taken with an image or description used here, please contact Ellen Behrens for permission at ellenbehr@aol.com. Thank you! DO YOU HAVE YOUR FREE COPY? Ever hear someone say they're a "full-time RVer" and wonder what that's like? Maybe you dream about ditching your sticks-and-bricks house and taking to the open road yourself in recreational vehicle. 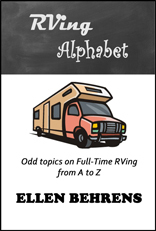 In her ninth year as a full-timer, Ellen Behrens shares some insights on the RVing lifestyle -- on topics not often covered in other places, all from A to Z. Print version now available for just $3.99 (US) plus S&H via Lulu. These cute books make great gifts! A little girl in the back of a car, a lost stuffed toy in the desert, a frantic mother missing a child... they all seem related, but can Walt and Betty Rollin stay out of trouble themselves long enough to make the connections -- before someone ends up dead? Walt and Betty Rollin are at it again! Read this newest Rollin RV Mystery adventure on your favorite e-reader for just $2.99! Just $9.95 (plus shipping)! 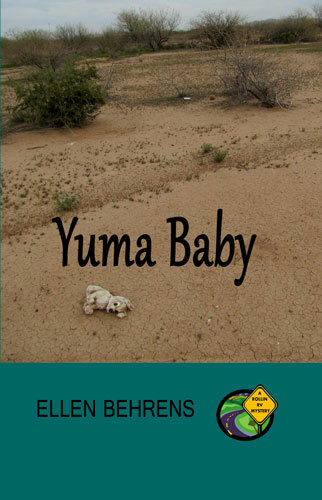 Click the Buy Now button for info on ordering a printed version of Yuma Baby. Prices Reduced on Pea Body! A simple bird watching venture into Pea Island National Wildlife Refuge in the Outer Banks of North Carolina turns Betty Rollin's birthday into one she'll never forget. The first installment in the Rollin RV Mystery Series featuring full-time RVers Walt and Betty Rollin is now available in e-book format for just $1.99 -- iBook, Nook, Kobo, Kindle... your choice. Get your copy today! Click the type of reader you use to link directly to the version you need. Save 25%! 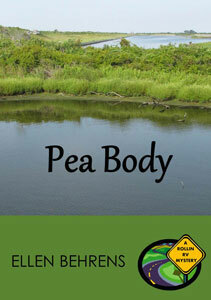 Click the Buy Now button for info on ordering a printed version of Pea Body. 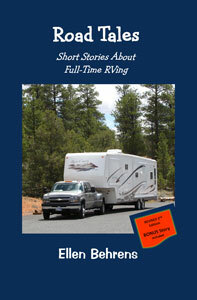 Great Gift Idea for RVing Friends & Relatives! The second edition of Road Tales includes a never-before-published story featuring Walt and Betty Rollin! For a full description and information on ordering a print version, click the Buy Now button below or the image above. Prefer your e-reader? Road Tales is now available through Amazon, B&N, and Kobo -- just follow the links below for info and ordering details. If you love the book, I hope you'll spread the word or leave a review of it on the site where you purchased it. Many thanks! 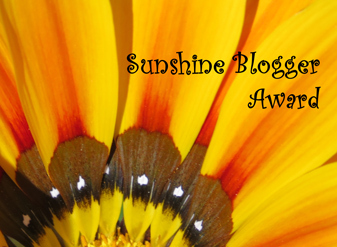 We're honored to be included on RV Resources! Looking for an Earlier Post? Amputee Travel... let the adventures begin!